Military Indoor Outdoor Flags - MARINES "Defending Freedom" Flag - Show your support for the brave men and women serving our country with CSI's new FREEDOM FIGHTER military flags. 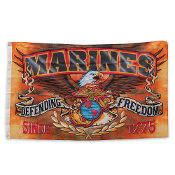 This Marines Defending Freedom flag features full color artwork, sturdy polyester construction, and grommets for hanging. Designed for indoor or outdoor use. 3' X 5'. The Eagle, Globe, and Anchor emblem dates back to 1868. The eagle with spread wings represents our proud nation. The globe points to worldwide presence. The anchor stands for naval tradition. Together, they represent a dedication to service in the air, on land and at sea.